Every 2 weeks I sit down with the good folks at Benzinga to chat about the markets on their morning radio show. Today we went over why I still think a more neutral to bearish stance is best tactically in U.S. Stocks. We also talk about this rally in Japanese Yen means to the Stock Market. This Yen strength combined with the deterioration in market breadth over the past month, there is a lot more to be negative about than positive. Stocks are not where we’ve wanted to be in April, and staying away has worked out well. The place to have been is in Commodities. I think this theme is here to stay. The only thing that pays us in this market is price. That’s it. So what we try and do is use a handful of supplemental indicators to help us identify when a change in trend is about to occur. One of the more helpful tools we have to achieve this is momentum. We start to see momentum readings diverge from price, before price ultimately peaks in the coming days, weeks, or months; depending on the timeframe in question. I personally choose a 14-period relative strength index (RSI) to gauge momentum across asset classes. You can read more about how I use RSI here. In this particular case, I want to focus on the obnoxious amount of bearish momentum divergences that we’re seeing in many of the most important indexes, sectors and stocks around the world. These “divergences” occur when prices make new highs, but momentum simultaneously makes a lower high. It’s a sign that a change in trend is approaching. Since we take a weight-of-the-evidence approach to markets, it’s not just that we’re seeing one or two of these sprinkled around. They’re showing up all over the place. Is the Mean Reversion Higher In Stocks Still In Play? What Do We Do Now That Treasury Bonds Hit Our Upside Targets? Normally I wouldn’t make too big a deal about a move above or below a specific moving average. In my opinion, the direction and even the slope of the smoothing mechanism is more important. 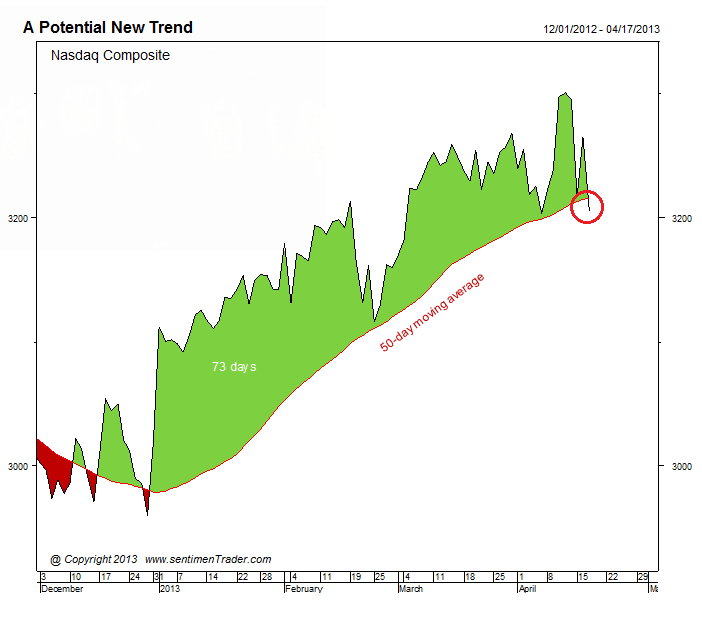 But in this case, the Nasdaq hasn’t closed below this particular moving average all year. So like the Small-cap Russell2000, like the S&P Mid-cap 400, the Nasdaq Composite can now be added to the “below its 50-day list”. Remember, these 3 are the averages that led us during this bull market. It now seems that these are the ones leading us lower, as the S&P500 and Dow Industrials have yet to break. As far as the consequences for the Nasdaq go, the news isn’t great. According to Sentiment Trader, the Nasdaq Composite just ended a steak of 73 trading days closing above its 50 day moving average. In the index’s 40-year history there have been 37 such streaks that lasted more than 3 months. But just 4 times has the streak ended after setting a new 52-week high within the past week. Over the next 3 weeks, the index lost value in all 4 of those occurrences. The losses resulted in at least a 4% decline each time. At its worst point over the next 6 months, the Composite lost at least 10% each time as well. 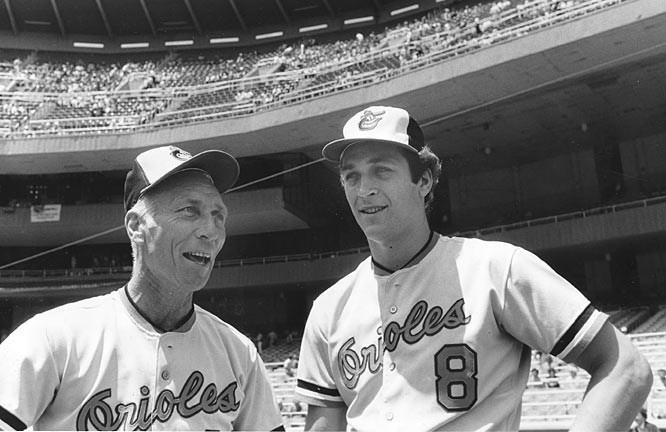 Cal Ripken Jr. (seen here with his father, Cal Ripken Sr.) plays his first major league game.